Steven Messing used Cinema 4D’s UV displacement maps and unique MoGraph module to create the Pilot’s Chamber set in Scott’s “Prometheus”. Steven Messing, Visual Effects Art Director on Ridley Scott’s Sci-Fi Thriller Prometheus used Maxon’s CINEMA 4D to create some impressive concept art as well as matte shots for the film. Messing, a well-known pre-visualization artist and matte painter has numerous other feature film credits that include Avatar, Alice in Wonderland and Transformers: Dark of the Moon. Messing spent weeks refining CG models that made heavy use of UV displacement maps and Cinema 4D’s unique MoGraph module to create the Pilot’s Chamber set. This included creating scale models of the center dais, desk console and sleeping pods. The final designs were delivered as very detailed model sheets for the construction of the sets and were also sent to MPC in London and WETA in New Zealand for the digital set extensions. Besides several physical set builds, Messing leveraged CINEMA 4D’s speed, agility and intuitive processes to produce CG environments, creatures, costumes and spaceship designs. He also worked through postproduction creating matte shots and additional designs under VFX Supervisor, Richard Stammers and VFX Producer, Allen Maris. 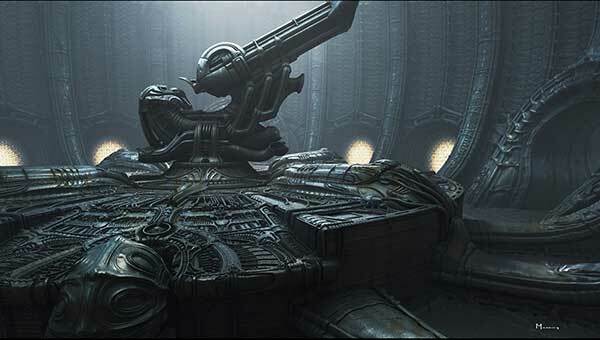 Incidentally, if you want to see effective use of stereography, check out Prometheus. While Grass Valley has gone through several ownership changes over the past decade, the company remains one of the premiere names in television and video production. Until recently GV still assembled its switchers in Nevada City, not far from its California base. But this past week word leaked out that the company announced would begin outsourcing the assembly and testing of this storied product line, moving the work from its California-based development center to a third party. Workers would be laid off. Outsourcing? Third party assembly? To some this seems like just another nail in the coffin of U.S. based manufacturing. True, it would be another U.S. manufacturer doing the work, according to sources. But it was hard not to think that here was another piece of our high technology history slipping away. Or is it? Grass Valley presented the decision as “part of the company’s ongoing transformation,” necessary changes so that it could be quicker in responding to changing market conditions. Less lead-time and improved quality would be the result, said Grass in a published statement. But what of its future course? The de-emphasis on homegrown hardware hasn’t lessened the company’s reputation for solid engineering. Like much of the computer industry, Grass increasingly emphasizes hardware virtualization. Launched at NAB 2011, its STRATUS initiative moves the company straight into a service oriented architecture (SOA) approach. While hardware won’t go away yet, Grass is pouring resources into moving STRATUS into every part of content creation and distribution. STRATUS, an “integrated modular software platform” is a suite of media apps that offer an integrated group of video production and content management tools housed in a single application framework. Using a common GUI, the apps can be quickly reconfigured so that each person working on the network sees just what they need to get their job done. This makes sense for the broadcasters and large video users Grass targets. Media companies are migrating to both file-based workflows and multichannel digital content delivery platforms. An IT-centric technology like STRATUS that can handle large amounts of data accessed by up to hundreds of collaborative users becomes key to staying competitive. So watch the video we shot of Eric Dufossé, GV’s VP, Solutions Marketing, at NAB 2012 to learn a bit more about STRATUS. As we’ve mentioned before, we often hold “breaking” news for a little while around here, at least until we can find some other news or insights to pair with it to give more depth, and hopefully add some insight. For more on STRATUS from Grass directly, check out this link to their Media Workflow page. Enjoy Week in Review? Then sign-up for our upcoming newsletter which will contain Week in Review and news about our Monthly In-Person Events. In a little while, Week in Review will only be available to subscribers of our newsletter. How do you sign up? Check out the sign-up area in the right margin of the front page…it’s as simple as that. Last week I caught a pretty unusual and surrealistic independently animated video on Vimeo called I, Pet Goat II. From a production standpoint, it was impressive. Content-wise, it was a conspiracy theorists dream. A bit heavy on the religious imagery however. I would suggest that the filmmakers, Heliofant (based in Montreal, Quebec), pick up some books by Richard Dawkins and Christopher Hitchens to broaden their perspective. In any case the art direction and animation is remarkably well done; it’s fun to try to figure out all the symbols (the subject matter is controversial). The piece seems to be popular however, since Heliofant’s website seems to have crashed the night I wrote this. The movie used a combination of motion capture and keyframe animation, along with Maya, V-Ray, FumeFX and RealFlow. Speaking of V-Ray, I can’t help but notice that it’s become a lot more popular for rendering images these days. V-Ray is a rendering app that works in conjunction with your 3D software by pre-empting its built-in renderer. There are versions for Maya, 3ds Max, Cinema 4D, Rhino, Softimage, Blender and even Trimble’s Sketch Up. V-Ray does a pretty good job of rendering photo-realistic effects such as global illumination, photon mapping, ambient occlusion, irradiance maps, lens effects (glare/Bloom) and more. Maya’s built-in renderer, Mental Ray and Cinema 4D’s excellent native built in renderer also do global illumination, HDRI, ambient occlusion, area shadows and more. So is V-Ray needed? Some say no: the built in renderer in each of those programs is more than enough to do the job. Still, a lot of people seem to be using it. Hmmm, I say. Looks like I need to do a review of V-Ray some time soon to find out why. But I’m curious. If you like V-Ray, tell us why in the comments section below. MOVA’s CONTOUR facial motion capture system was used to animate the faces of the Tharks in “John Carter of Mars”. 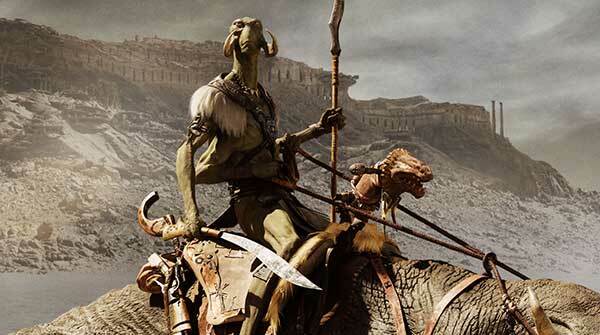 Last weekend I got a chance to check out Disney’s big production John Carter of Mars and found it quite enjoyable. It might not be the best picture ever, but it’s pretty good science fiction. Some of the effects and animation are notably good. In addition it was a remarkably balanced combination of CGI and live action footage. Okay, so a few scenes could’ve been better, but I can’t see why the press was so down on it. Especially good are the native Martian species known as the Tharks who, I thought, were quite convincing and believable. Rarely did the illusion that they were entirely computer generated get in the way, and you just believed that they were there, interacting with the real flesh and blood actors. This is not an easy feat, integrating a cg character so the lighting and performance looks believable. Few movies have done it as convincingly, in my opinion. The faces of the nine foot Tharks were animated with the Contour facial motion capture system by a company called MOVA. Their system has been used on many other films including The Avengers, Snow White and the Huntsmen and many others. Many appreciate its markerless capture system that uses phosphorescent makeup to capture many points. Check out MOVA’s website for more information about how it works. These days, submitting a film to various film festivals is easy; I’ve been learning that as I submit my own film to various festivals around the nation. This task is easy in most part because of a website called Withoutabox. In the past, sending your film to different festivals meant paying the entry fee, printing out all kinds of details about your production including cast, crew, synopses and other information and sending it to the festival. Want to send it to a different festival? You’ll have to start the whole process again. But Withoutabox works like that personal assistant you sometimes imagine, who will handle all these boring details for you. How’s it work? Well, you still have to start from the beginning by entering all the information about your film. Not sure what the festivals want to know? Don’t worry. Withoutabox will lead you through the process step by step. Once you finish, the info is then part of its database. Here’s the good part: Once the info is entered, you’ll never have to do it again. That’s because festivals can access all of this info electronically. This is a major timesaver, especially if you want to submit to many different festivals. You can also pay the entry fee through Withoutabox in one secure and centralized place. Add a couple of dollars and you get limited insurance in case something goes wrong. Once you’re done, simply send your movie to the festival (some 850 festivals worldwide participate). Or you might want to use Withoutabox’s Secure Online Screener option. This allows you to upload your movie into Withoutabox’s (well, Amazon’s) cloud system. Festivals can then screen your picture without the need to send them a physical DVD. This leads to less energy waste all around, which is better for the environment. I like that Withoutabox also enables you to track the submission status of your picture. By logging into your account you can see if the festival has received payment, whether your film has been received and that it is in consideration. In addition, Withoutabox allows you to link its account to your IMDB account. If you should be so lucky, you cannot only promote it, but you can sell copies of your DVD or as a Video on Demand screener via CreateSpace. The Internet is a useful thing.